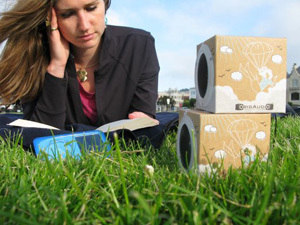 OrigAudio, a Chicago-based audio company, has come up with a super, green idea: portable speakers made of recycled materials that begin life flat and fold together like origami. 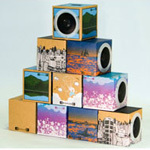 Called Fold N’ Play, these speakers are incredibly attractive and come in five different designs, including a pair that lets you create your own artwork. The speakers don’t require batteries and you can use them with any audio device that has a 3.5mm headphone jack. Don’t expect amazing sound quality. But for only $16 they’re perfect for the kitchen, your kid’s room or taking on your next holiday.